Marijuana possession, its distribution, and production are all illegal in Salt Lake City and throughout Utah. marijuana use to law enforcement is going to go unpunished. This of course is not the case and law enforcement is looking to enforce all the laws of the state and if you self incriminate yourself by telling law enforcement that you have been using or possessing in an illegal substance then you should be prepared to be charged with a drug crime. The best practice is to not discuss your case with law enforcement and hire a criminal defense attorney as soon as possible. Like other drug crimes the main offenses in relation to weed are marijuana possession, marijuana possession with the intent to distribute and production of marijuana. A marijuana charge starts at a class B misdemeanor with possession of less than an ounce of marijuana and the charges go up from there based on whether there is an intent distribute, whether the offense took place in a drug free zone, and how much marijuana was involved. Additionally, an individual could be charged with a DUI or a DUI Metabolite based on marijuana use. What About Weed Obtained Legally Out of State? 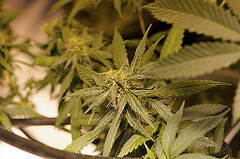 Due to the legal or legal with a prescription nature of marijuana in other states in some cases a defense attorney can get a defendant a very good deal if the marijuana was obtained or used legally in another state, however, this depends heavily on the court and prosecutor where the individuals case is. When it comes to possible penalties a person may face if they are convicted with a marijuana charge they are the usual incarceration, fine, and probation however, there is usually an additional focus on drug assessments and treatment. Finally, a conviction of marijuana possession also includes an automatic 6 month suspension of the individual’s driver’s license. If you are being charged with marijuana possession or other marijuana crime you should call the attorneys at Criminal Defense Attorney Salt Lake City to get help with your case. Our attorney’s have represented hundreds of individuals with their marijuana case and we the experience and know how to work out great deals with the prosecutors or fight the charges through trial if necessary. We will investigate every aspect of your case to make sure your rights were not violated and we will make sure you understand your options throughout the process.